I see a similar pattern in GBPUSD as in EURUSD so overall it looks like GBP, like EUR, is set for a retrace rally, which, if correct, is already underway. 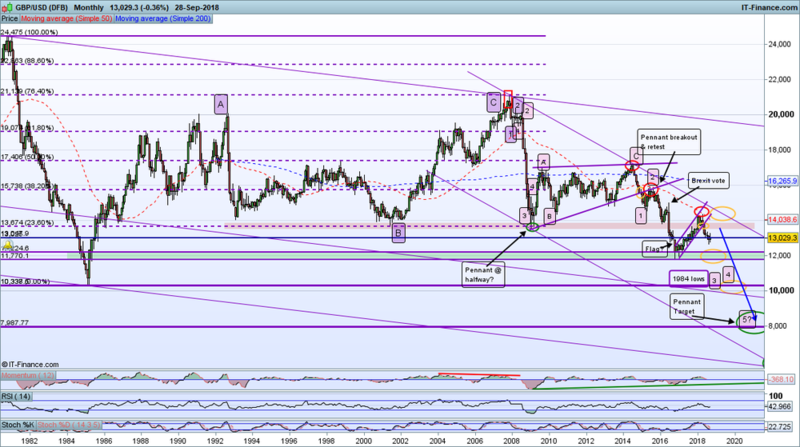 When this concludes the Bear should get it's claws in again as USD rallies strongly across the board. Looking at the GBPUSD Monthly chart we can see that GBP has been in decline for a long time, in fact a steady decline since the early 1900s but we don't have that much data here. In more recent times GBP crashed down to almost parity in 1984, something I expect to see revisited in the relatively near future and perhaps a breakthrough to below parity this time? One thing of note is that GBP was falling significantly well before Brexit and therefore I do not subscribe to the notion that Brexit is a major driver because macro global factors are much stronger. Not that it really matters much to me what is driving a move, so long as I recognise a move and get in... We can see on the Monthly chart that recent price action has been in consolidation in a Flag formation, hard to trade due to whiplash effects. However there has been a significant breakout to the Bear side now and I believe this market to be in a short term retrace (or relief) rally that will set up a strong motive wave Bearish move soon. The Daily chart shows the Flag break and current retrace more clearly. This appears to be moving in a classic A-B-C form and is mirrored in EUR and AUD (probably more too but note CAD and JPY are on different paths). By my reckoning the Wave A is done and now the markets are moving back down to complete the Wave B before rallying hard to complete the overall relief rally. I am looking for such a rally to come into the resistance zones around about the point at which the Flag was first broken through (probably beyond that for AUD as it happens). 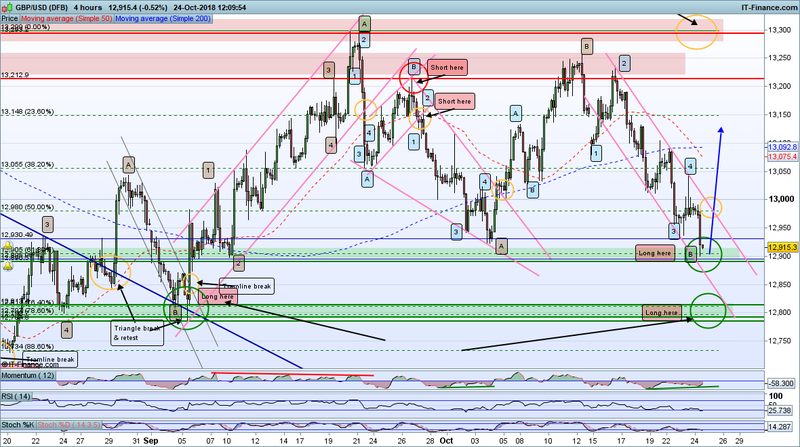 This would be in the 13800 area for GBP/USD. Actual turn point can only be pinpointed by price action of course, so this is only a guide. Hard to pinpoint a Wave B termination, they are unpredictable in nature as the market forces slung it out between Bear and Bull sentiment. Sometimes they run fast to closure and sometimes there is a lot of whiplash. Of note it looks to me that GBP will drop more heavily than EUR in the coming week or so. If price breaks the 15 Aug low then the retrace is already done but I think the likelihood of this is lower (at this point). Any one see it differently? Let me know your reasoning if you do. great set of posts you've been making recently @Mercury - it looks like (from post history and what caseynotes said) that you've been a previously prominent poster in the Community. From a relatively newbie to a vet, welcome back once more. Assume you haven't seen or used the newer community from it's previous 'red' days (of which I must admit I was only passively viewing). Interesting that you said that brexit isn't a major driver to the recent depreciation. I agree that we've been steadily devaluing (I read today in the FT the guy who has been writing the Long View piece for the last 12 years and made a similar comparison on the equity markets) but I would push back / content your point about brexit. Yields in stable currencies are the key players here, and no matter what BoE and others can see, a lack of any clear direction is the issue. As for a reversal ... that would be nice around about now. Looks like there is the conservative conference this week, and we're looking at a potential insight into brexit negotiations. At this point, irrespective of personal opinions, we want to be looking for a hard and firm stance on the subject. This will be the big macro mover. LOL @cryptotrader but it depends where you are going on holidays I suppose. If it's the US then yeah you need to buy forward but if elsewhere then maybe ok. Note that I suggest Brexit is not a major driver but I don't discount it totally. I suspect it is a short to medium driver of sentiment but by overall contention is that it will prove NOT to be significant in the face of larger geopolitical and global economic forces. Perhaps we need a separate thread on this particular topic. Note that Brexit doom mongers point to a falling GBP as a problem for UK economy but this is incorrect in my view. a weaker pound is good for exports and is a natural reaction to a poor trade deficit position, which is what we have. Perhaps, we will look back and that the stars for Brexit if the EU collapses in on itself, the Euro collapses (as I believe it will) and the UK successfully opens trade deals with the commonwealth nations and others that, together with a weaker pound fuels export trade. In such a scenario the UK becomes, what it has historically been very good at, a trading nation. GBPUSD makes a fresh low on this bearish move but I still believe this to be a retrace prior to a stronger rally to complete a larger time-frame retrace back to about 13,800. If I am right about the Flag breakout then this is roughly halfway, which indicates a termination of this move around 12,800 (but could end sooner). Whereas EURUSD has a decent Positive Momentum Divergence (PMD) on the 4 hourly we don't see this so clearly on GBPUSD, which added weight to my view that GBP will turn later and/or go deeper than EUR. If this all works out then there could be 1000 or so points in the offing on GBPUSD in the coming weeks prior to a resumption of the Bear. GBPUSD now following EURUSD and AUDUSD down in line with my road map so far. If this pair is to turn back into a Rally then there are 2 possible near term zones of support. A break of the Triangle (Pink lines) would be a strong indication that the rally is on, especially after a touch in one of the 2 support zones. I am reminded one again that this type of analysis is evolutionary and mush adjust to price action, hence the update to the 1 hour chart (note the higher time-frame charts remain unchanged at this juncture. Price action over the next few days will tel the tale I feel. Is anyone trading this pair (or any FX)? Do you have a view to offer? Please do! 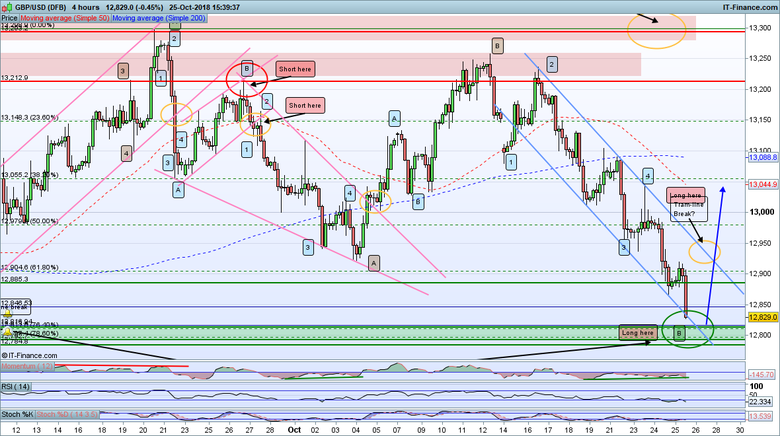 Unlike the EURUSD and others I think GBPUSD has already turned with a much stronger break through of my Triangle set up. This has been accompanies by a strong drop through a significant support zone on EURGBP, thus proving my bearish stance on this market (alas no final retrace). 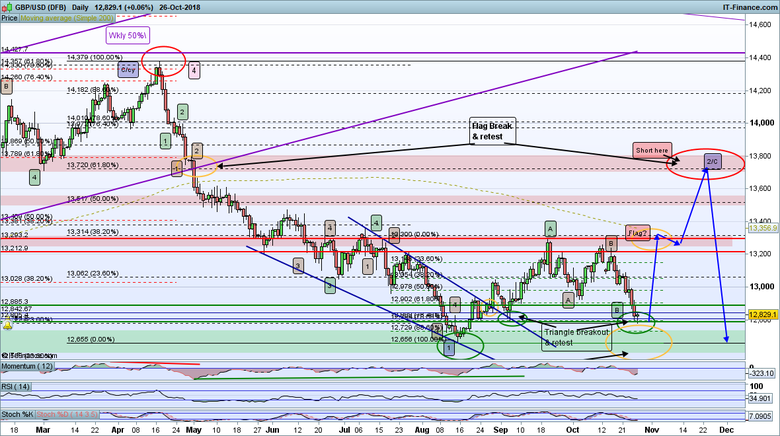 This Triad set up though supports both my immediate bullish view on GBP and short term Bearish view on EUR. Looking at the Triad is very important when trading related FX pairs to ensure your assessments stack up. 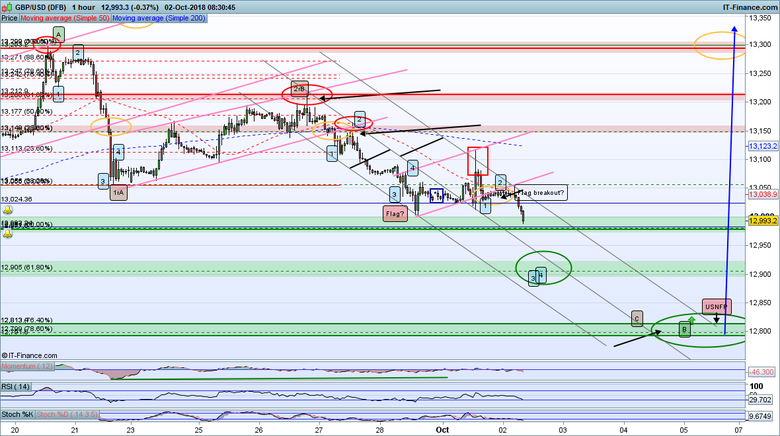 On the attached 4 hourly chart you can see the Triangle set up and breakthrough. However I don't see GBP firing off hard if EUR and other USD pairs are not and in fact going in the opposite direction. I'm not saying this can't happen, just that I don't see it as I see a relief rally in the offing on EURGBP. 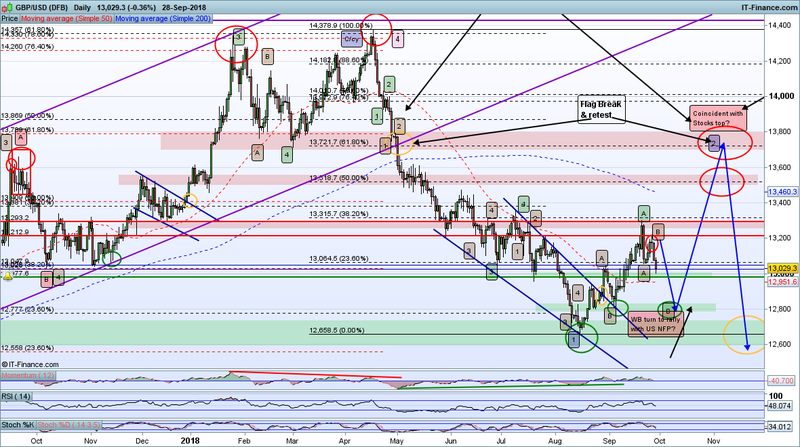 Therefore my assessment is to expect a retrace in EW 1-2 back down to the original breakout for a retest before a hard rally away in wave 3, which will be long and strong and set up the medium term rally back to the 13,800ish area. My approach is to hold my breakout long trade with sufficient stop room not to get taken out on the retrace and add as I see a turn and strong rally. 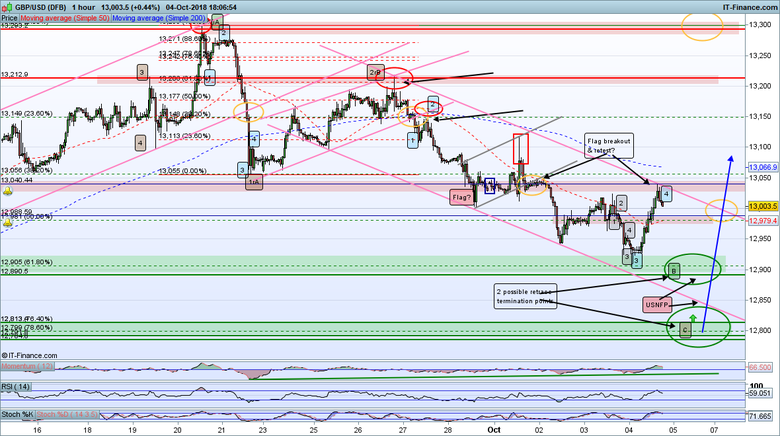 Anyone got a view on GBPUSD? Please share. Just wanted to say that I'm continuing to read these posts and find them v interesting. I don't have much to add as I don't generally trade FX (too many influencers) but I do like the have a broad overview of things so I do try and keep updated. One thing I wanted to ask was what is your reasoning for/against having the trend lines drawn on the wicks rather than just the body of the candle? I noticed slight differences based on which markets and/or timeframes you're looking at. Thanks for that @cryptotrader, before I answer your very good and relevant question, can I ask what you do trade (the name suggests cryptos of course...). 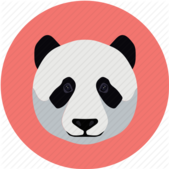 Also interested in your too many influencers comment, if you care to open a new thread on that in another area I would be interested in that topic. Regarding the drawing of lines there are 2 main schools of thought in my experience (there may be more I guess). I will generally go conservative with method #2 but I also use my personal experience of charting to find a best fit (most touches on a line), which could incorporate a combination of the above and even some fake breakouts. There is a lot of reading and educational material about on charting and a must if anyone wants to use these techniques but as ever there is no substitute for learning by doing. Some markets are quite smooth (the larger ones like SP500, EURUSD, Gold etc). Others can be more spiky (like GBPUSD, Silver, Oil). It depends on size and whether there are a few big influencers (like Oil). This is relevant to you point about why you do not trade FX. When drawing chart objects I do consider this aspect by tolerating more fake breakouts and spike-throughs on the more volatile markets, also need wider stops for actual trading of course. Thanks for the overview @Mercury - it certainly makes sense so I guess it's a bit of market knowledge after trading quite a while. Sort of like a requirement to feel it out and find what works for the market you are trading. I used to do the same on the oil markets of 2-3 years ago and used to trade a fair bit then. Since then I try and stick to a small asset group and learn the movements of that before moving on. In my mind as long as something moves then we can have a trade on environment, and I don't see a need to have a significantly diversified collection (note we're not talking about investments - when we have those we want diversification, but when it comes to intra day trade I prefer to limit myself). Like you said I like cryptos at the moment - the moment I picked my username it would seem! But also trade things I know / have an interest in. Gin, hence fevertree recently, technology, hence GoPro and Tesla. I also like the breadth of discussion from other asset chat. Think it adds as everything is connected these days. GBPUSD makes a fresh high after a Triangle breakout retest. A push through near term resistance is further bullish evidence. 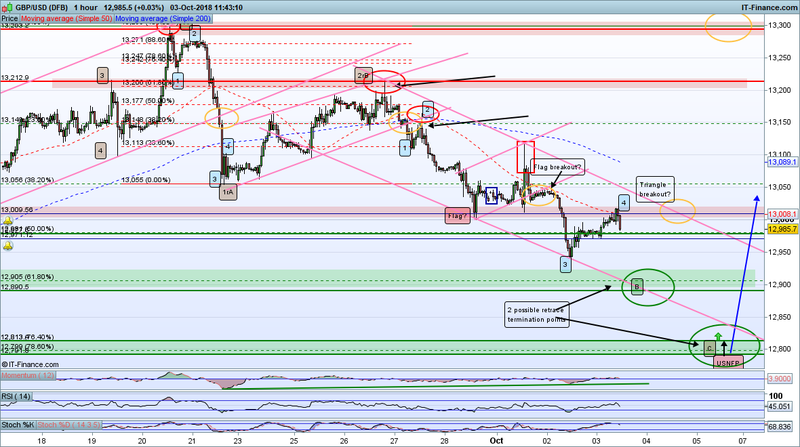 EURUSD also turned, not yet confirmed. Good trade this seems to be following nicely. 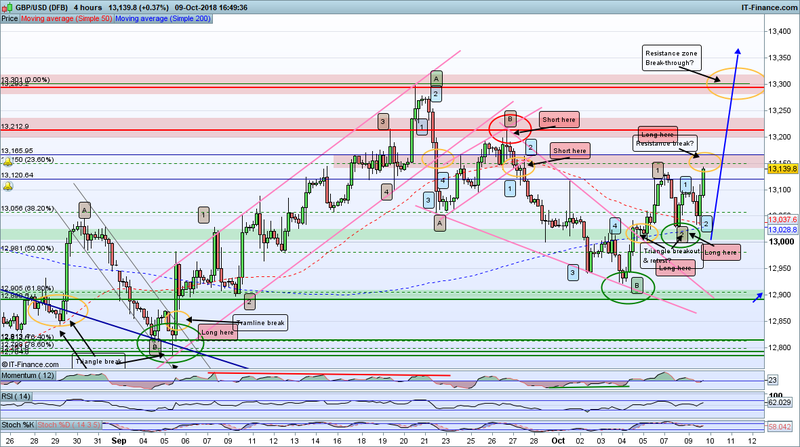 Dangerous times though, if this market is set to retrace to the 13,800ish level it needs to get on with it. I'd need to see a strong rally up to around the 13,350 area initially now and then perhaps some consolidation there before a final push on up. 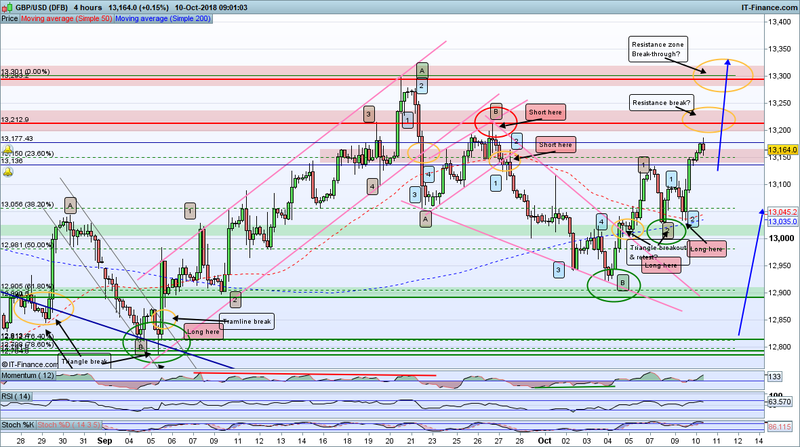 Need to see the AUDUSD push on fast and EURUSD is critical for the overall USD Bearishness. Keep stops at sensible points and NEVER EVER move them. Don't be tempted to pyramid until your initial trades are secure. As with all USD pairs GBP is retracing a bit this morning but this market has rallied harder than others so I am more confident that the medium term (say to end Oct) direction is up. However I cannot say how far the retrace will go, or whether it will turn quickly and breeze through the upper resistance. GBP is always a bit more spiky than EUR and especially so now with Brexit jitters. My approach here is to hold what I have ans seek better new entry set ups elsewhere (e.g. EUR and AUD). Full retrace to previous breakout retest circa 13,800 is my target with similar targets on EUR and AUD. When you're wrong best recognise it and move on. All my USD pair longs are now closed for no loss but I am not sure this means the big USD rally is on yet. 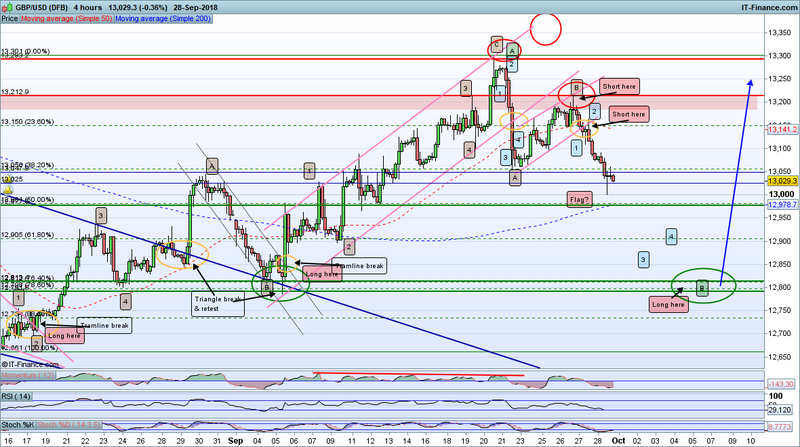 If crucial support levels are broken it will be but I think we will have a few twists in the plot before that happens. The move is merely the conclusion of the Wave B to either Fib 62% (12,900) or Fib76/78% (12,800) before a hard rally away in Wave C to my original retrace level of about 13,800. Incidentally the turn points are the same as my original target for Wave B. 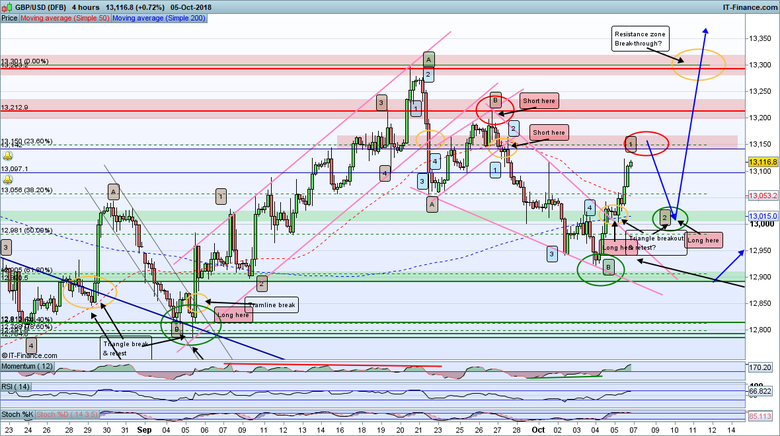 Similar to EUR this pair is now into one of my 2 turning zones. 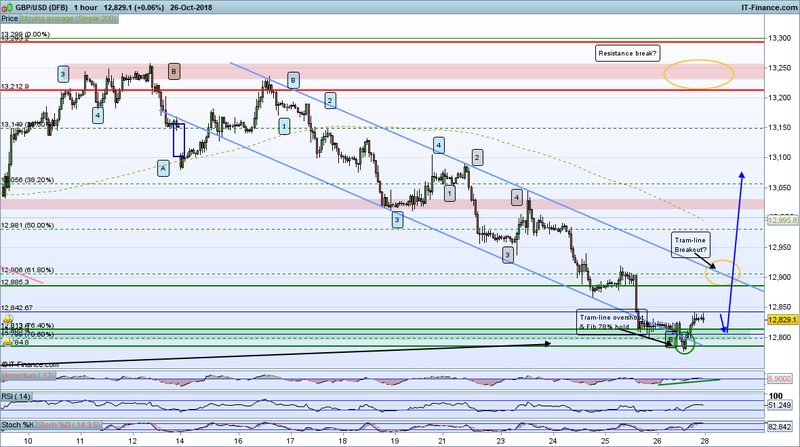 A turn here is now more likely IF EUR also turns at the Fib 78% in that case. A turn on USD generally is bullish for Gold/Silver, as is a stocks rally. PMD and oversold indicators also support a rally at some point relatively soon. If you don't want to take a speculative trade then a break of the upper (pink) tram-line is also a decent trading point, once we see an actual turn. So my first target proved to only be a consolidation point, no surprise as the EW count was a bit off but the second will be more interesting perhaps, lets see. EUR is doing a deeper retrace and may hit the Fib 88.8%, which is acceptable for a B wave but obviously it is a short drop to support break and the beginning of a full on Bear move so need to watch carefully for this scenario. The safer trading point is a breakout of the blue tram-lines, after an established turn. If taking a Long on the 76/78% level need to protect well with stops but keep in mind that GBP is a spiky market, especially these days. Very similar set up to EURUSD (check post on that thread for more detail, which I wont repeat here). The Daily chart shows me a retest of the Triangle breakout zone and rally away at a likely Wave B turn. 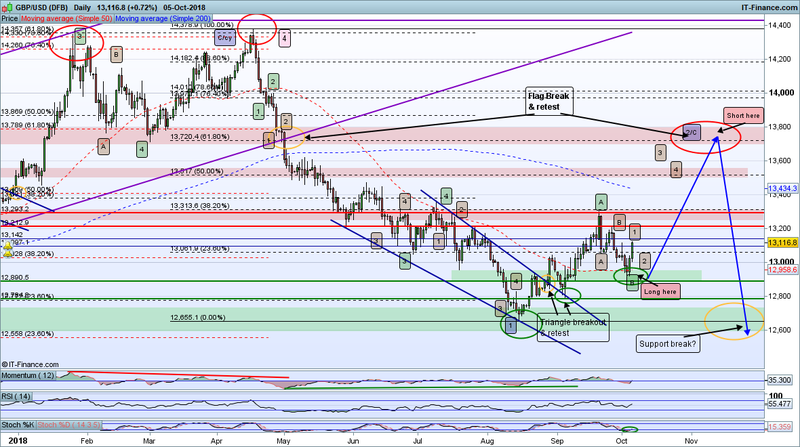 The rally on GBP is weaker than EUR at present so the chances of another leg down are higher here but the same 1-2 retrace is also a high probability candidate. On the 1 hour chart you can see the turn at Fib76/78% with an overshoot (common on the spiky GBPUSD). 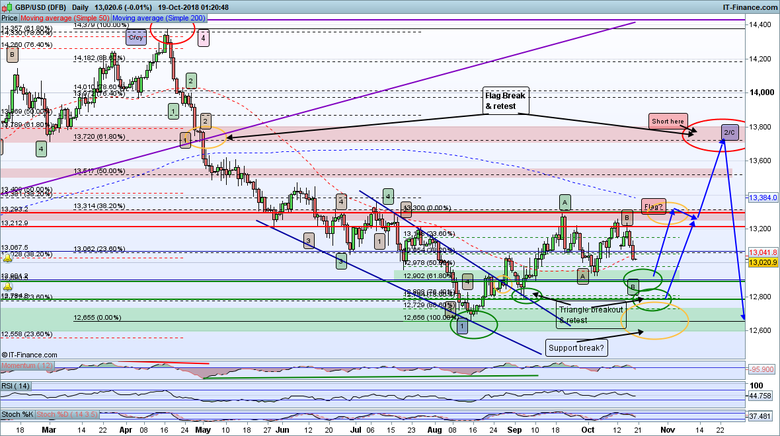 If we see a small 1-2 retrace and rally away that will be a bullish signal for me, as will a break of the Tram-line. Similar to EUR there could be circa 1000 points on offer here but in retrace rally (Wave C) prior to a long bearish phase to come. Looking fro a Flag about 13,300 to set up the 13,800 rally end zone, which would align to the Weekly chart Triangle breakout, which would necessitate a spike through overshoot of the Fib 62% (again quite normal for this pair). However you cannot ignore the Fib 50%, time and price action will tell the tale.